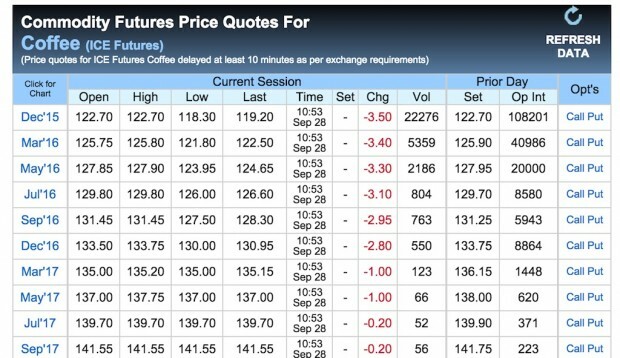 The latest ICE futures prices for coffee as of this publication. A few days ago, I wrote about the need for producers to manage their exposure to price. Let’s start with a disclosure: I have no formal financial training. However, in my work with the coffee sector, I recognize that my focus has been on mitigating the risks — climate changes, diseases — on the production side. All of this work could be rendered useless if a farmer/cooperative does not also manage their risk to price and the market. As I started to learn about price risk management, I recognized that there are lots of folks who have been working on this topic and who are trying to provide cooperatives and farmers tools to be able to deal with market volatility. My goal was to start a discussion with various points of view — with traders, producers, cooperatives, NGOs and certifiers — with the goal of trying to demystify this topic. 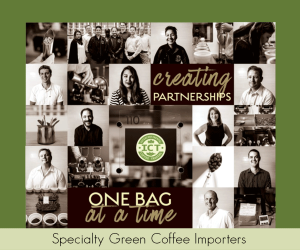 The first interview is with Ed Canty, former lead coffee buyer at Keurig Green Mountain, who is currently running his own consulting business. Ed was the Fair Trade coffee buyer at KGM when he got serious about finding ways to incorporate price risk management (PRM) strategies for the coops he bought from. The following is a condensed and paraphrased conversation from our last few phone calls. KK: I’m coming around to your point of view — that price risk management is an issue for the entire industry and not just for producer organizations. You told me that all public financing that has been invested in coffee producer organizations gets put at risk if the organizations don’t have a PRM strategy in place. This risk is then borne by the PO, but has effects throughout the supply chain. EC: Let me back into this. Using derivative financial products like options is a great tool. However, before contemplating using them, an organization needs to understand where their financial risk is. Understanding financial risk requires mapping out how your commodity-based contracts perform in different market scenarios — “what happens to my contracts in a dollar coffee market as compared to a $3 coffee market.” Those commodity-based contracts need to be negotiated with an understanding of the real cost of collecting and processing coffee. This issue is much bigger than the scope of this interview. We could talk about the power dynamic of producer organizations not comfortable with bringing cost of production data into their negotiations for fear the buyer will choose to shop elsewhere. We could talk about buyer’s behavior to always take the lowest priced coffee without considering external factors like investment in relationship, resiliency, or even feasibility of deliver into consideration. We could even discuss the difficulties organizations have in determining accurate costs of production. If you can accept what I have written above, financial products become useful tools in maintaining minimum price and taking advantage of market opportunities. The time to discuss these tools is when the contract negotiation happens, not after the market changes significantly. They become increasingly less expensive the further away the market is from the cost of production value. The nuances of using these financial tools are much more complicated than can be written about in a paragraph. However the point I’m making is these tools become increasingly useful once both sides of the negotiation accept that maintain a minimum price is in both their best interests. KK: In one of our earlier conversations, you mentioned that the strategies for estates are going to be different than those for PO.Why is that? KK: Let’s talk about the most sophisticated approach to PRM: the use of options. The examples I have seen of it working really require close participation of the buyer/importer. Can you sketch out how these might work? Options are great tools to bring into a contract negotiation as solutions to market volatility, while allowing each party to manage their own price discovery. I’m a little hesitant to give you a detailed example. The risk in managing these tools is in the details. A few paragraphs of text on how to use options is not an adequate for understanding to start using them. However, in the spirit of bringing some clarity to the opportunity of using these tools, I’ll provide two examples. As I write this, today’s March 16 C price is $1.20 USD. A producer organization is negotiating a contract for March and has analyzed that when the market falls below $1.40 they begin to go below their cost of production. So they want to sign a fixed price contract at $1.40 — this does not include the differential paid for the coffee. However, if they sign a fixed price contract and the market rises above $1.40, they begin to lose value, as producers they collect from need to be paid current market price. So they investigate the cost of a ‘Call Option’ to protect against this upside risk. The cost of a ‘Call Option’ for March 16 at a $1.40 strike price would cost 4 cents/lb. So they would ask for an additional 4 cents in their differential negotiations to manage this risk. Let’s pretend the market for March was at $2.00 USD today. This same producer organization is negotiating a contract using a break-even cost of production market value of 1.40, not including differential. They want to protect against the market going below their floor price, yet still maintain the opportunity of an upside market at any given time between now and shipment. They investigate the cost of a ‘Put Option’ for March 16 and determine, in this fictitious example, that it will cost 2 cents/lb. So they would ask for an additional 2 cents in their differential to manage the market going below their cost of production floor. These tools are not new to this industry. However, they are not commonly used by producer organizations. In fact, the same tools can manage risk between any transactional relationship. For example, importers commonly use them to manage the risk between themselves and a roaster. One of the most innovative uses of options I have seen are programs that manage the risk between farm-gate collection (seller) and producer organization (buyer). We have seen marketing volatility that almost reached 10 cents in a day this last year. This can have a devastating effect on producer organizations’ abilities to collect coffee and manage risk. This is one of the most advanced uses of PRM strategies that I have seen. EC: In conclusion, I’d add that using PRM strategies is the exact opposition of speculating in the market. People tend to confuse these two things when we discuss using financial tools. These same tools are used to speculate when they are not tied to a physical product. What we have talked about today is more firmly embedding them in the negotiation and physical trade of coffee. This means any gain from using the tool offsets loses in the market, by design. So there are no windfalls created by using them — rather, just healthy insurance against the risks present in coffee trading.